ASP.NET MVC team recently integrated the excellent open source library called DotNetOpenAuth (DNOA). DotNetOpenAuth originally was created to add OAuth and OID Authentication capabilities. The library bakes in functionality to let your application to be an OAuth Server or an OAuth client (or both). Thanks to the integration efforts by the ASP.NET team, integrating DNOA to use an external Open Auth or OID provider is now as easy as un-commenting a few lines of code and registering yourself with the Provider. Today we will do just that. Given the popularity of Facebook, a vast majority of people have Facebook accounts and if we can use Facebook to authenticate people on our website, we make it easier for the user by not requiring them to remember an additional password for our site. If you have a Facebook account already, you’ll need to verify it by either providing your Credit Card or Telephone Number. If you are using a phone number the phone should be capable of receiving SMS (Text messages). With this pre-requisite handy, let’s get started. 2. If you don’t have a verified account, on login to the dev portal, Facebook will ask you to verify the account using Credit Card or Phone number. As mentioned above, they will text you a verification code if you are using the phone number. Put in the code and you are good to go. You should see the above bar at the top of the page. 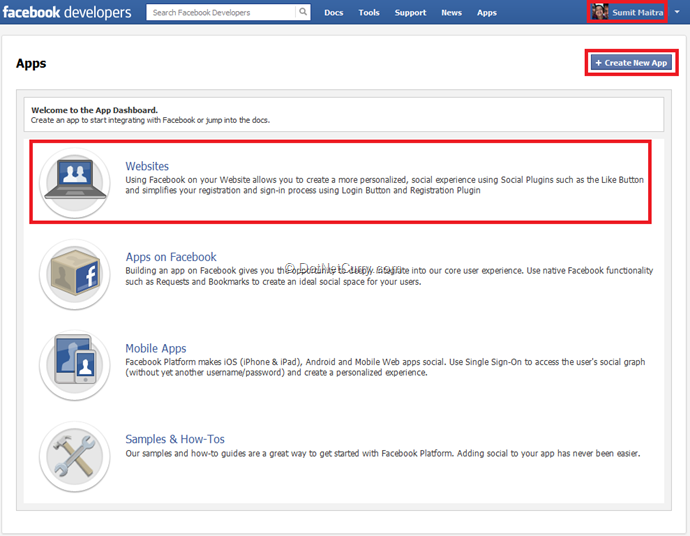 Now that we are logged in as Facebook developers, let’s setup an App so that we can leverage it in our own Web Site. 1. Click on Apps in the toolbar, Facebook will show the type of apps you can build for it. 3. Pick a Name and a Namespace (though mentioned as optional, provide it here). You can leave the Web Hosting unchecked. Click Continue. Fill in the captcha and you will end up on the configuration page as follows. b. Next expand the Website with Facebook Login field. It is empty currently. We have to come back to it once we have our WebApplication ready. 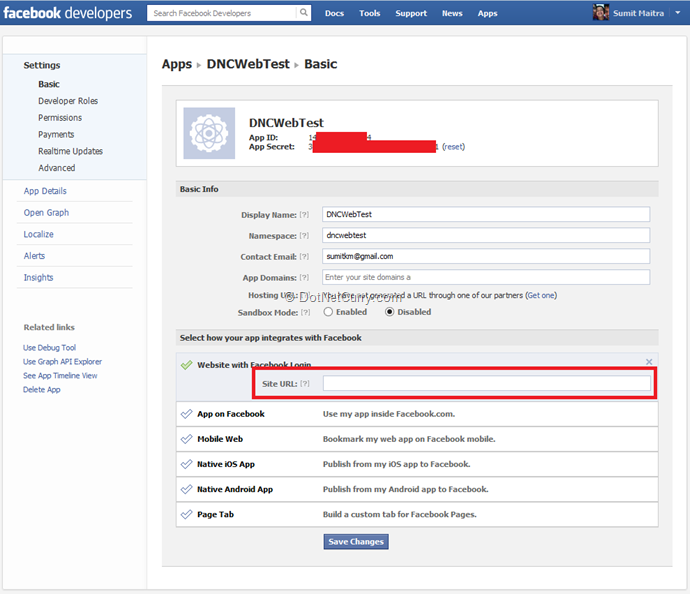 Now that we are nearly all set with the Facebook App, let’s shift focus to the ASP.NET App and hook the two together. 3. Secret Next we open the AuthConfig.cs file under App_Start folder and uncomment the RegisterFacebookClient line. We replace the empty values with the values loaded from Web.Config using the ConfigurationManager. And that’s all the configuration that’s required. 5. Go back to the Facebook App Settings page and update the “Site URL” with the above URL. Save the settings. When we move the application to production, we’ll have to update the “Site URL” in the Facebook app to match our production URL. 7. Click on the ‘Facebook’ Service login button. It will navigate you to the following page. 8. Facebook is telling the end user that they are using their Facebook account with ‘DNCWebTest’ (our application). Once you log in, for the first time you’ll get the following confirmation dialog. Note that the DNCWebTest app by default has only access to basic info and email address of end user. Once the user clicks “Go to App”, Facebook re-directs back to our app. The connection string doesn’t really have anything to do with the provider. It simply uses an instance of (LocalDb) by default and uses a Database Name generated by Visual Studio when the project was created. This however becomes the connection information that is used out of the box. Initially the database is of course empty. But on first Registration or login request, a set of tables are created by the Membership Provider using this connection information. 2. Let us see what these tables are. Open the Database Explorer and refresh the ‘DefaultConnection’ node. Expand the tables to see the tables created by SimpleMemberShipProvider after the first run. 3. Right click on the UserProfile table and select Show Table Data. As you can see the, UserName registered by the user is stored in the UserProfile table. 4. Next select the webpage_OAuthMembership table, right click on it and select Show Data. This shows the ProviderName and an ID value returned by Facebook that is unique for each user who authenticates. This is tied back to the UserProfile table using the UserId Foreign Key reference. 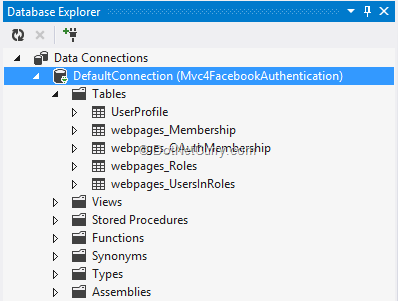 This concludes this post on using Facebook Authentication for your ASP.NET Web Application. It assumed you (as a developer) have a Facebook login already. If not, go ahead and create an account and then create a Developer profile as explained above. In future episodes, we will see how to retrieve information from Facebook after you have logged in using Facebook Authentication. Suprotim Agarwal, MCSD, MCAD, MCDBA, MCSE, is the founder of DotNetCurry, DNC Magazine for Developers, SQLServerCurry and DevCurry. 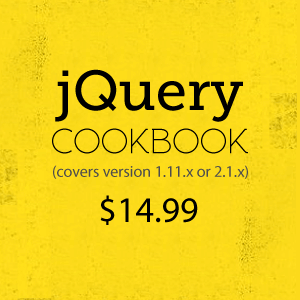 He has also authored a couple of books 51 Recipes using jQuery with ASP.NET Controls and The Absolutely Awesome jQuery CookBook. Suprotim has received the prestigious Microsoft MVP award for ten consecutive times. In a professional capacity, he is the CEO of A2Z Knowledge Visuals Pvt Ltd, a digital group that offers Digital Marketing and Branding services to businesses, both in a start-up and enterprise environment. So can I use this without creating an account and get more information like email etc? I didn't understand the context of this statement - 'without creating an account'. If you are referring to Step 8 (second image) above, then Email + authentication token + Facebook UserId are the only things that you will get from Facebook. To get more information you have to use dedicated Facebook API (and also tweak your App Setting in Facebook depending on the information you need). Let us know if I got the question wrong. "In future episodes, we will see how to retrieve information from Facebook after you have logged in using Facebook Authentication." - I eagerly look forward to this part, as I'm sure others are interested as well. I guess the real question is how to use the dedicated FB API to get additional info such as birthday, to post to the user's wall, etc. Thanks! and also tell how the facebook information of the user like birthdate,gender,name,address will be shown in my website page. I'm very interested in the followup too. I'd like to get the user's birthdate, gender, address, and picture would be great. You might want to change that screen? Clean and clear explanation.Thanks for sharing.But one problem is which your code snippets are not showing color for the code syntax.So if you can correct it,it'll help for our readability. Jack Owens: Thanks Jack, yeah looks like I missed out on that one! Thanks for the article, is it possible to achieve the same in Asp.Net 4.0 Web forms? Also what happens with the regular membership database now? bye using this i implement facebook login and get user details,but how can i get details of page likes when that user login?